With direct ties to an economic climate, the construction industry can often feel like a rollercoaster ride. 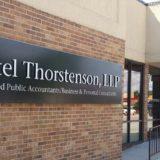 Through the ups and downs, Ketel Thorstenson, LLP (KTLLP) can help you solve today’s problems and build for tomorrow. KTLLP serves as a trusted advisor to construction businesses of all sizes in the Rapid City, Spearfish, the Black Hills and Gillette areas. Business owners and independent contractors seeking advice on everything from income taxes to financing and bonding will find answers with our specialized Construction team. In addition to facilitating and advising on the day-to-day tasks of running a successful construction business, we assist our clients in obtaining the best financing options available in the marketplace, and we continue to help our clients expand their bonding and financing availability. Your reputation hinges on the quality of every job you complete. KTLLP’s construction accounting specialists are committed to helping you achieve excellence—on schedule and within budget—at every step. Our team offers support at every phase of the project, from financing and bonding to contract negotiations and tax planning. Over many years of trusted accounting and consulting service, KTLLP has cultivated an understanding of construction accounting practices, construction cost management systems, job costs and job cost reporting, and the critical components of the contractor’s financial statements. Give us a call today or submit a request for services form on the contact us page.